The British Humanist Association has just launched a new advertising campaign on the London Underground. 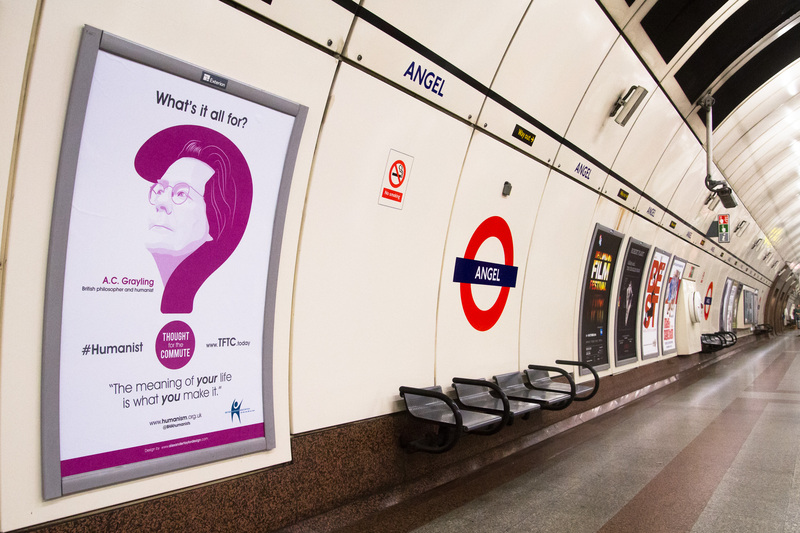 Under the heading, “What’s it all for?” the posters feature quotes from atheists such as AC Grayling and novelists like Virginia Woolf. Partly it’s to rival BBC Radio 4’s ‘Thought for the day’ which continues to be religious. I rang up the chief executive of the BHA this morning, Andrew Copson. He was more friendly than the folk in certain other secularist organisations. It was an interesting exercise in conversing with someone from a different point of view, while asking my questions about the campaign. I think most Christians would say that there is very little broadcasting that they can relate to as Christians: what little there is, such as Songs of Praise, is often designed more for the older generation, or can come from a very liberal point of view. I suspect other religions might feel the same. But it seems that this feeling is the same for humanists. This surprises me, because to me, almost everything on TV and radio has an underlying humanist worldview and secularist assumptions, which are definitely not neutral. I’d love to see some quantitative evidence of to what extent religious and humanist views are expressed on TV, and whether they’re given a positive or negative light. In any case, the conversation did help me to understand this guy’s point of view, at least a little bit. Perhaps we all notice opinions that are different to ours much more often than we do our own. The difficult thing is to communicate with the people holding those opinions, but that’s the way we come to understand each other.